to join in this occasion and with their talents to prayerfully contribute to the blessed enrichment of the Holy Liturgy. May the Lord reward them for love. It will be remembered that the teachers and students of the church school in Gračanica made a special effort to prepare a formal reception for dear guests as an expression of the love and hospitality of our community. During the entrance, the students of the church school formally lined up in folk costumes to welcome our dear guests. This image will remain recorded in the history of our community, and will represent a reflection of one time and an example to future generations. On this occasion, we give our heartfelt gratitude to the wonderful children, their teachers and parents for their magnificent welcome on behalf of the overall community in Windsor. There is special joy made by seeing that most of the present students have received Holy Communion and blessing from the hands of two Bishops. Let the Lord bless this young generation, and always be with those who direct them, their parents and teachers. After the completion of the Holy Liturgy, the Most Reverend Bishop Mitrophan, as the host Bishop, wished a warm welcome to his dear guests Bishop Teodosije and Iguman Ilarion. Then Bishop Teodosije made an appropriate address, expressing gratitude first of all to God for everything, and on this occasion also to the host Bishop Mitrophan on the love he shows for the suffering people in Kosovo and Metohija and for the hospitality during this visit, which was solely for the benefit of the survival of our people in Kosovo and Metohija. In witnessing the situation, Bishop Teodosije emphasized, among other things, that there are people in Kosovo and Metohija, especially emphasizing an impressive number of 120 monks in 20 monasteries. Monks and nuns, as well as all the Serbs who remain and survive in this area today are compared to the Myrrh bearing women who remained faithful to the Lord Jesus even on the Cross, but after were granted to be the first to herald the news of the Resurrection of the Lord. On behalf of the overall Windsor community, Reverend Vladimir Vranić wished a warm welcome to the two Bishops and at the same time expressed his wholehearted gratitude on this historic visit and great blessing. After the Holy Liturgy, a table of love was prepared at the Serbian Center for all present. A large number of devout people responded to the invitation to join this special spiritual gathering, to help and support the suffering people in Kosovo and Metohija. When entering the Serbian Center, the two Bishops were again happily welcomed by children in a ceremonial line with bread and salt, which were brought by this year's sponsors for the St. Sava celebration 8th grade students Ana Jelić and Marko Špirić. At the entrance the choir SSS Gračanica greeted the Bishops and singing The Lord’s Prayer led all the attendees. After the blessing of the table, the children once again delighted everyone present with their sincere welcome, then recitals, choral singing, as well as folklore dances. A short but comprehensive program, this time was carefully prepared by the efforts of devoted teachers and the equally great sacrifice of parents. But certainly, the most deserving are the children for the wonderful program that was organized on this occasion, and we especially thank them and invoke God's blessing for their perseverance in goodness. 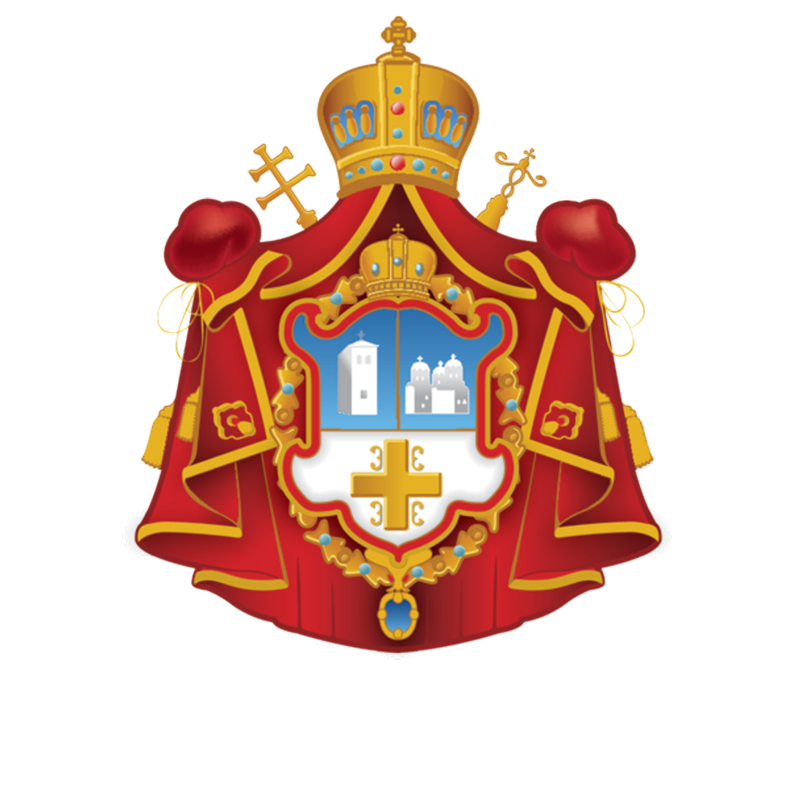 A short, but comprehensive program was led by Mr. Djordje Velicković, who has been unselfishly involved in Gračanica Windsor for years, but this year especially, to the joy of both the parish priest and the pupil, taking on himself the duty to teach the Serbian language to the oldest students. Many years of long life! First there was an address by the president of the church-school congregation Gračanica, Mr. Vladimir Pribojan, who on behalf of the Governing Board of Gračanica Windsor wished a heartfelt and warm welcome to Bishops Mitrophan and Teodosije, as well as Iguman Ilarion, at the same time greeting the current president of the church-school congregation of Sv. Dimitrije, Mr. Goran Jamina, and all those present at the Serbian Center, expressing gratitude to all those who, for Windsor, supported this historic event and in any way contributed to organizing it at the desired level within a very short period of time, in a matter of days. Then, Reverend Vladimir Vranić, on his own behalf, also used the opportunity to once more greet their Graces Mitrophan and Teodosije, and Iguman Ilarion. Father Vladimir first of all expressed the gratitude of the Windsor Community to Bishop Mitrophan for paternal love, which he constantly shows, as well as on continuous and archpastoral prayers, but: We are especially thankful to you at this occasion to receive the blessing of the Bishop of the Holy Land of Serbia, the land of Nemanjić, of Saint Lazar, soaked with the martyr's blood of all martyrs and new martyrs - Kosovo and Metohija. We are grateful to you, dear Bishop Teodosije, that you are here today with us, and we welcome you as a Bishop in whom the entire history, the whole blessing and all the blessings of the Holy Land of Serbia are gathered. Remember us when you are among the holy places of Kosovo-Metohija, Father Vladimir Vranić said, among other things, on this occasion. As host, Bishop Mitrophan in his address on this occasion also greeted the guests Bishop Teodosije and Iguman Ilarion, directing all of us present to the New Testament example of St. Paul the Apostle, who called on his brothers, especially the brothers of one faith, to help each other, so are we also called today not to tire to help each other, and especially our suffering brothers and sisters in Kosovo and Metohija - said Bishop Mitrophan. In continuation of his address, Bishop Mitrophan announced the decision to grant priest Vladimir Vranić the honor of protonamesnik, which is a special recognition to the entire community in which priest Vladimir Vranić serves. In the end, Bishop Teodosije spoke, expressing his wholehearted gratitude to Bishop Mitrophan for brotherly love and warm hospitality. On this occasion, Bishop Teodosije presented a very touching testimony on the situation in Kosovo and Metohija and the suffering of the Serbian and non-Albanian people. However, Bishop Teodosije looks at the whole tragedy through the light of hope in the Resurrection, the strength of the Lazarus covenant and the sanctity of the Land of Kosovo-Metohija. Sanctuaries located in Kosovo and Metohija go beyond any human calculations and thinking: in Decani lie the relics of the Holy King Stefan of Decani. If the Holy King does not want to leave, how can we then think of leaving the Holy Serbian Land? Monasteries and churches are not merely museums or monuments, but places where constant prayers continue to be attended by over 120 monks and a large number of priests. It is a living Church and there is no reason to change it. The Living Church continues to generate new martyrs. Thus, last year's Assembly of Bishops of the Serbian Orthodox Church canonized three new holy martyrs: St. Vasilije the Baker, St. Grigorije of Pec and St. child martyr Bosiljka from Pasjana. Particularly shocking is the testimony of St. Martyr Bosiljka, who was only 17 years old when she was abducted by the Arnauts and forced to marry and renounce her faith. Although she was a child, she remained steadfastly loyal to her Orthodox faith to terrible death. Her mother, while gathering pieces of the child's body, through tears, was still singing in the spirit of our Church that in all occasions prayers are carried up in song, with dignity saying that if her daughter being so young had preserved her honor and faith, then she, as a mother, would keep her dignity . The Seminary in Prizren, which was destroyed to its foundations in 2004 in a terrible pogrom, has been restored today and has 50 young students. Bishop Teodosije, who himself teaches in that seminary, says: God willing, these will be the future priests and workers in the vineyard of the Lord and the best ambassadors of the situation in Kosovo and Metohija. The bishop said that children in the area of ​​Kosovo and Metohija are constantly being born and that the latest research shows that the Serbian population there is considerably younger than the populations in other parts of Serbia. All this instills hope for the Resurrection of the Holy Serbian Land. Thanking once again Bishop Mitrophan and all those present for the warm welcome, as well as the unselfish donations that everyone had the opportunity to give for aid, with the aim of supporting the survival of the suffering Serbian people in Kosovo and Metohija. After reading the prayer, the Bishops visited the Serbian Heritage Museum - the only museum of Serbian heritage in this area, where Mrs. Julka Vlajić and Anne Dube acquainted them with the activities of the museum. There was preliminary agreement to organize an exhibition on the monasteries and shrines of Kosovo and Metohija in the foreseeable future. At the end, the guests, accompanied by the president of the church-school congregation "Gračanica", Mr. Vladimir Pribojan, also visited the non-profit residential property "General Mihailović" near Gračanica. We are especially grateful to Aleksandar Media NEWS, whose goodness and professionalism recorded and immortalized this historic visit at a high professional level. We thank God for the opportunity to be part of such a sublime, dignified and above all special spiritual assembly, and to incorporate ourselves, at least a little with our prayers and contributions, in the Holy Land of Serbian Kosovo and Metohija.